Cute and Fluffy is a 5 reel online casino game that pet lovers will simply adore. 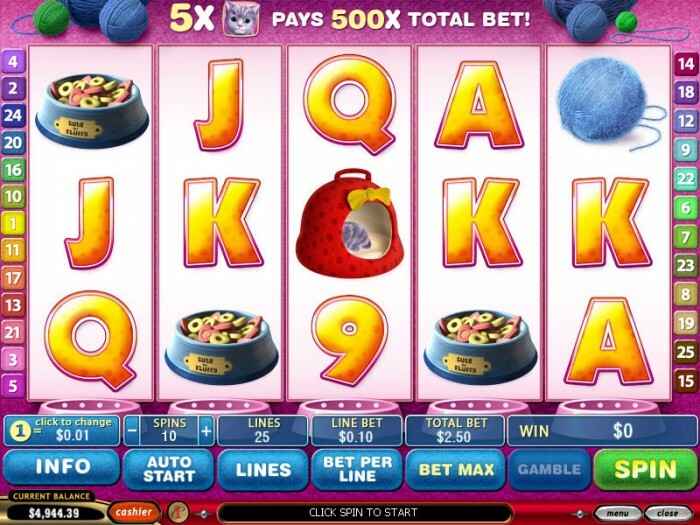 It is a 25 payline video slot that features the cuddly characters of Cute and Fluffy. Cute is a beautiful little kitten, and Fluffy is a perky little puppy. The theme for this slot game centers on the possessions of both Cute and Fluffy. The first thing that players will see when the game starts is both Cute and Fluffy cuddling up together. How precious! The game has high value cards that range from the ace to the nine. They show up on reels in a bright yellow color. It fits well with the Cute and Fluffy color pallet of pink, purple, yellow and blue. This makes the casino game even more playful and cheerful like its star characters. This game also has other symbols that pet lovers will like such as bones, baskets, food bags and colorful balls of yarn. The sights and sounds for Cute and Fluffy are very attention grabbing. Although there isn’t any background music for this game during actual play, it still makes great sounds when the winning combinations are triggered. The game also plays a catchy tune while you are reading game information. The animations are wonderful as well. Cute, Fluffy and the bone symbols are very animated during certain points of the game. The game can really tug at your heartstrings when Cute jumps out from behind her basket, or when Fluffy sticks his head out from behind his food bag. Basically, all of the symbols in this game are animated except for the card symbols. The Cute and Fluffy casino game has Playtech software. Players have the option of speeding up the game, turning the audio off or on, and playing the game in full screen mode. Players also have the ability to look at their playing history, which can be used for future wagering. Play up to 10 coins per payline, and play all 25 paylines. Play denominations from a penny to five dollars. These betting options are appealing to both low and high rollers. The game also has a gamble game where players can gamble with current winnings. Pick from 4 cards. Get a card that is higher than the dealer’s card and win the gamble game. The wild symbol for Cute and Fluffy is the little puppy Fluffy. This symbol can be substituted for all of the other symbols, except for the Cute symbol. The wild symbol can be stacked, which is an added feature that many games do not have. Get 5 Fluffy symbols on a payline and get 10,000 credits. When the bonus round for Cute and Fluffy is triggered, you will see amazing animation. Normally, the bone symbol comes on the screen and then it is dropped into a plate that is underneath the reel. Get four bones in the plate, and this will trigger the bonus round. This provides 4 times the total bet, and it gives 5 more free spins and a multiplier. This bonus has extra credits and free spins that can be triggered over and over again. This Cute and Fluffy casino game gets good reviews from players, but it does not have a progressive jackpot. However, the game does have a fixed jackpot that gives 10,000 credits. The second highest jackpot grants 1000 credits. Get five like symbols and win from 100 to 10,000 credits. If you don’t understand the payout, click on the button at the bottom of the video game for more detailed information. Clearly, the Cute and Fluffy casino game is just as adorable as it is exciting. It is a fun game that is filled with darling little puppies, kittens, big payouts and wonderful animation. It is bound to become a favorite among many gamers.